GetDivorcePapers.com provides professionally completed, 100% court-approval, money-back guaranteed Illinois divorce forms. Just create an account, complete the interview, and file for divorce. Our case managers do all the work for you, and send the completed Illinois divorce forms when they are ready to be filed. 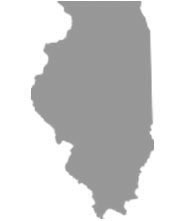 It is essential for the plaintiff to be the resident of the Illinois for three months before the case is filed. Papers can be submitted into the counties of either of the spouses. Communicable disease catches either of two spouses. Desertion for a whole year. Aggression and violence in the home. Basic needs of the child i.e. school education, medical expenses, and social needs. Attachment of the child with other persons in home. The openness in each of the parents to let child meet the other spouse freely and frequently. Residential environment of both the parents. In this regard, parents are required to sign a Join Parenting Agreement that defines the rights and duties of each parent for the best nurture of child. Contribution from both spouses in obtaining the property. Economic conditions of both spouses. Health and age of the both spouses. Professional skills and employment of spouses. Duration that marriage lasted for. Health conditions and ages of both spouses. Income and financial strength of each spouse. Ability of dependent spouse to get established on its own. Living standards of the couple during their marriage. Any separate income of the child and his or her needs. The living standard that has been developed for child during the marriage of his or her parents. Emotional conditions of the child. Needs and obligations of both the parents. If court feels any chance of reconciliation, then it requests for the mediation courses for the parents. Same can also be asked by either of spouses. There is no need of a lawyer when applying for divorce in the state of Illinois. A divorce case which is filed without any help of an attorney in any of the states is known as Pro Se Divorce. Literally, Pro Se is a Latin phrase and it means "on her or his own". Process of getting the divorce without the help of lawyer may vary from one State to another. These types of divorces are perfectly legal and enforceable in Illinois, and are actually very convenient. Usually, once settlements have been made regarding property distribution and custody matters among the spouses in case of a mutual divorce, Pro Se Divorces are filed.